For years I have wanted to get out into the Gore Range. It's rugged, it's hard to get to, none of the mountains are class one walk ups, and they are all 12ers or 13ers which keeps away the peak bagging 14er crowd. 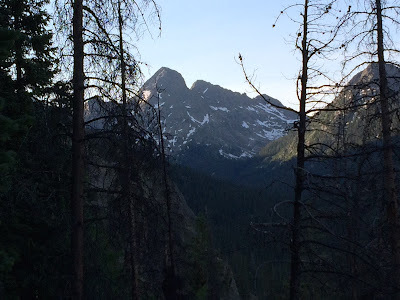 Plus, they are actually close to Vail and Avon, which means very accessible by car, unlike the Crestones or other mountains in southern Colorado. Why Peak C? 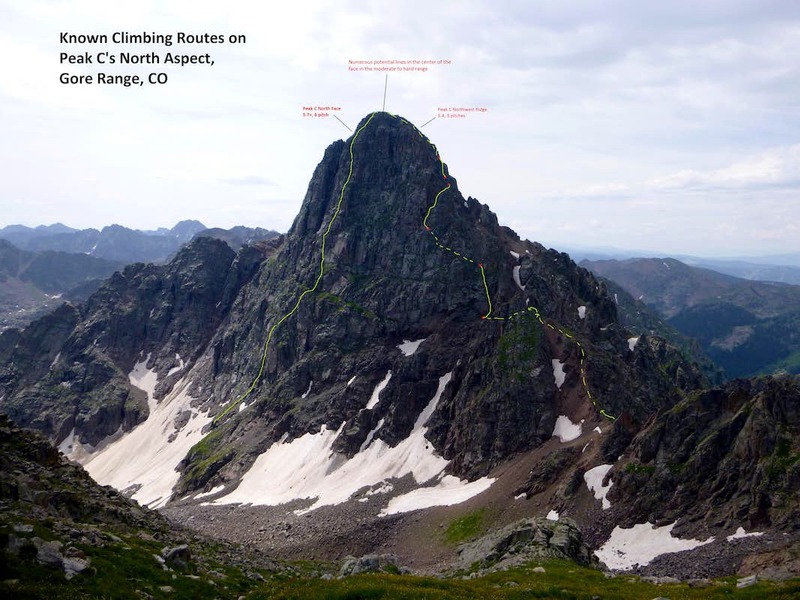 It's official unnamed, you won't find it on any map, only 13,200 feet, why would anyone want to climb such a thing? I'll tell you why, adventure, exploration, the unknown. I looked at that picture and it just screamed at me, 'come climb me!' You see after climbing the known (including attempting Everest) time and again there is a certain aspect of the desire to explore and push the limits of possible that is missing. Plus, few trips reports, or trip reports of failed attempts, only add to the allure of going after it. We woke up at 3:30 AM at Steve's parents condo in Avon, Colorado, home of Beaver Creek Ski Resort, which to be honest I had heard of but never knew where it was. It seems to be the Vail for both those with a lot more money, and those who don't care about the name recognition of Vail who have maybe a little less money than the standard Vail crowd. After brewing some coffee, and making sure that everything was packed, we drove to the trailhead north of I-70 about 30 minutes on a good dirt road, I know for a fact that a Toyota Previa could have made it up the road. We started at 5:17 AM just as the sun was coming up. Peak C in the center and Mount Powell on the left. The first few miles of the trail were very flat along a lake and stream. We moved quite quickly, until we crossed a little creek and started uphill to the left, north. Apparently everyone loses the trail when they hike up to the unnamed kneeknocker pass, so we didn't feel bad about losing the trail. 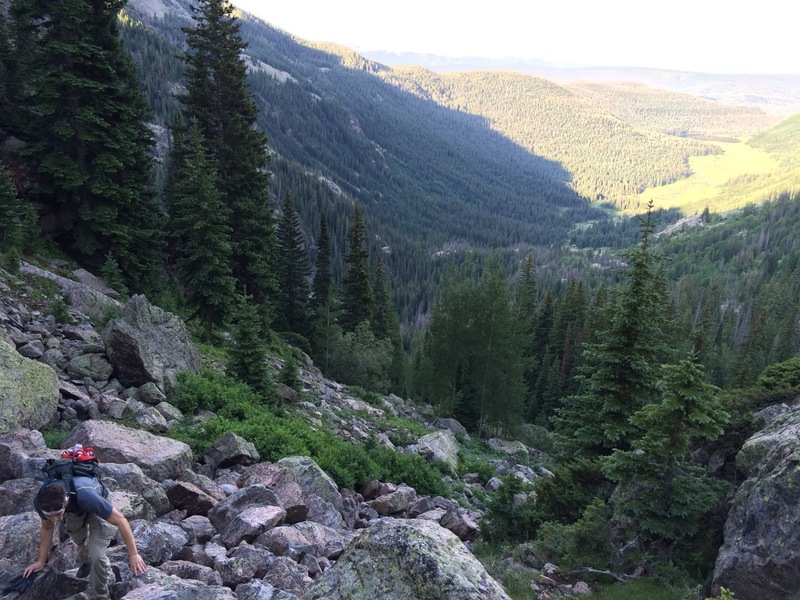 Inevitably the trail grew more steep as we neared the pass. Steve hiking up the unnamed Kneeknocker Pass. When we reached the pass we went over a bump in the ridge maybe 50 meters high to get to a second slightly higher pass and get our best views of the north face. When we finally got up there I wasn't feeling like going out to attempt a first ascent. I mean look at that north face! Much of it looks climbable, but there are a couple cliffs, even an overhanging section closer to the northeast ridge. We were moving well, but we weren't (or rather I wasn't) climbing as well as I thought necessary to do a first ascent on that face. So we decided to do the ridge, a more mellow climb. Steve led off first and we traded leads throughout the climb. Steve leading the first pitch. While the rating on the route picture above went at 5.4 for the ridge we climbed, I am skeptical of that rating, 5.5 or even 5.6 seems more accurate. Most of the route was fourth class or easier, but there was maybe four or five little 15 foot tell sections of rock climbing that make the whole thing more than a scramble. 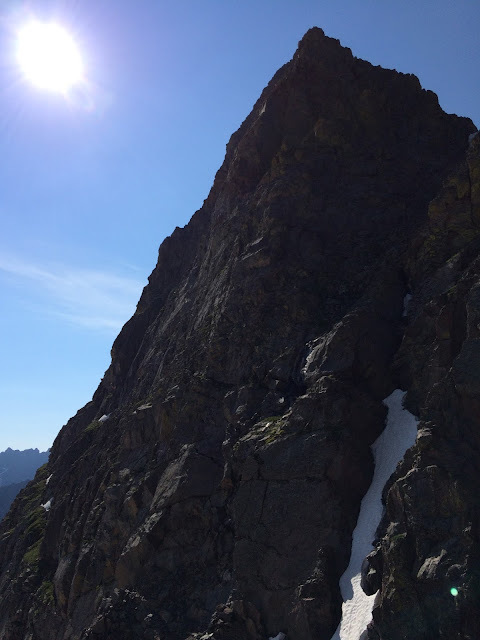 I would like to say, my lead climbing has been lacking lately, I have retreated off many leads, but this day went really well, I was climbing fast, running it out between pieces of protection and using the loose alpine rock holds quite well. I think I just get motivated by bigger objectives. We climbed a number of actual pitches, maybe four or five, and then we did a fair amount of simul-climbing (simultaneously climbing both of us at the same time with the rope and a few pieces of protection between us). Around 11 AM the clouds started to build and we were nervous it would rain so we moved a little faster to get up and down. We made it up to the summit at 12:30, our proclaimed turn around time based on the weather that day. We took a couple pictures and a video. Then we began the descent down, hoping to avoid the rail while rappelling. There are no bolts or pitons on this route, so we repelled off of rock horns leaving no gear behind, which is a perpetually nerve racking event. I liked this climb for the large number of skills we had to use. It wasn't blindly following a topo to the next two bolt belay station, or waiting in line on the route. The first 12 hours we were out we only saw one other person close enough to talk to, a guy with two llamas. The descent turned into a bit of an adventure. It looked easier to go through the valley to the south of the valley we hiked up, we both agreed. However, once we got to the treeline it turned into a route finding mess as we found cliff after cliff after cliff and ended up repelling when we were almost at the river. Finally we made it back to the trail, even though we could not see it until we were ten feet away it was so overgrown with brush. The last few miles as always were tiring because we were safe, yet not done yet. Sometimes I cry on the hike out, the day being so emotional. This day was so positive that I did not, I could have spent longer out there and a small part of me says we should have ventured out onto the north face. Previa! With a roof rack! Also, Peak C in the middle of the picture, left side of mountains in the background. Car to car it took us 12 hours 48 minutes reaching our car at 6:05 PM, and we were never rained on. It was a very good day in the mountains!